10 Ways to Beat the GMAT This Year! Preparing for tests, especially the GMAT, is no easy task! In between filling out MBA applications, applying for college scholarships, and researching the Best Business Schools, you have to carve out several months for GMAT test prep. These free GMAT tips will help you jumpstart your GMAT test prep! Create an Error Log. An Error Log is a spreadsheet designed to help you track your incorrect questions for later review. Add to it on an ongoing basis. You will want to re-take GMAT practice questions multiple times to make sure you do not get them incorrect a second or third time. This will improve your GMAT score more than you think! Free GMAT Error Logs are available online at GMAT websites such as Beat the GMAT and GMAT Club. Practice online. The GMAT is an online exam, so to ace the GMAT you will need to become an expert at negotiating between the screen and your scratch pad. GMAT test prep books such as the OG, or those made by Kaplan, Powerscore, and MGMAT are excellent sources of GMAT practice questions, but make sure you also do a significant amount of studying for the GMAT online. Mimic the test-taking environment as best you can as you study. Websites such as Grockit and MGMAT offer six free GMAT practice tests with their membership or purchase of one of their books. Ideal for adjusting to an online format! Learn your grammar. Success on the SC portion of the GMAT entirely depends on your ability to recognize the most-tested grammatical errors. Use a good English-grammar book or a reputable GMAT online SC resource to review the basics of subject-verb agreement, independent/dependent clauses, and grammatical construction. Take full-length tests. 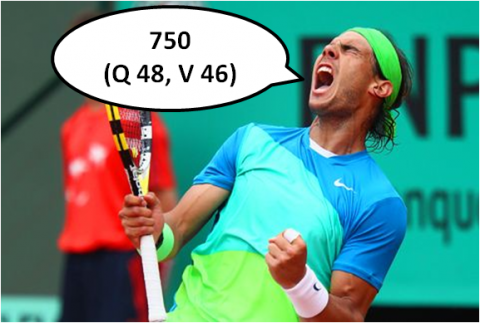 The GMAT requires a great deal of stamina. Even if you have limited resources, most test-prep companies such as Knewton, MGMAT, Kaplan, etc. offer one free GMAT practice test online. Understand why you get questions wrong. Some students believe that more questions answered = better scores on the GMAT. Fundamentally, answered a ton of GMAT practice questions will only lead to faster pacing, but without solid strategies and disciplined reviewing, your overall score will not improve. Don’t be a lazy reviewer! Study in shorter blocks. Don’t burn yourself out as you aim for better GMAT scores. It’s better to study in shorter 2-3 blocks, taking frequent breaks to eat, stretch, and exercise, rather than to park yourself in front of your computer and books for 10 hours at a time. The GMAT takes commitment, but you don’t want to become a GMAT zombie. Don’t neglect AWA. Read through the free GMAT list of essay topics for each AWA essay provided for free on mba.com. You will want to practice writing at least 3 of each so that you are comfortable with the timing guidelines. Have a template in mind for each GMAT essay and get feedback from other GMAT students. Take notes as you read RC passages. Keep it short and simple, but make sure to extract and write down the important information in each GMAT passage: topic, scope, author’s tone, function of each paragraph, and main idea. That way you already have predictions for most of the GMAT RC questions and you will save time by not having to constantly re-read the passage. Use “12TEN” for Data Sufficiency. Instead of writing down ABCDE for the answer choices on your scratch pad. Use the acronym “12TEN” to represent each choice. T = together. E = either. N = neither. This will help you keep straight what each GMAT answer choice means, and allow you to cross off the options quickly and efficiently as you evaluate the statements. Backsolve and Pick Numbers. Use these GMAT Quant strategies as much as possible on the more difficult GMAT Math practice questions. Remember that there is often more than one way to get the correct answer! Choose the method of least resistance.